Home › Health, Lifestyle, Mental Health, Technology › Does Leaving the Phone Behind Stress You Out? A couple of weeks ago, I forgot my phone. I rushed out the door that morning, in a hurry because I was running behind for a presentation I was giving. I didn’t realize I’d left my phone until I arrived at my destination. It was much too late to think about returning for it. Actually, it wasn’t a relief. Leaving the phone behind stressed me out quite a lot. The biggest reason I feel stressed when I leave the phone behind is due to concern for my son. What happens if there is an emergency and the school calls? What if I can’t be reached. Back when I was married, this didn’t stress me quite as much because I knew that my then-husband could be reached. Now, though, my ex lives 2,000 miles away and can’t do anything about an emergency, even if the school did call him. While my mother is an option, she usually turns off her phone while she’s teaching, so reaching her wouldn’t be immediate. When I got home and eagerly checked my phone, I did find out that I had missed a couple calls and several texts. However, there was nothing from my son or from his school, so that was a relief. But a few days later, when my phone died while I was running errands, my son did try to contact me because something he ate at school made him sick. I didn’t get the message for almost an hour. While that hour didn’t make a big difference in his day – he just had to spend time with the school nurse until I got there – I think about some of the situations in which it might matter more. When I was growing up, we didn’t have cell phones, of course. I’d be gone for hours, or my mom would be out running errands, and there would be no way to connect. We all survived, obviously, but things feel different now. We feel like we are accessible to our loved ones, and we want to be. We want to be available just in case something goes wrong, and we don’t want to miss something important. Leaving the phone behind didn’t provide me with a sense of freedom; it stressed me out. I think the main difference between that situation and the unplugging I do when I go camping is the element of choice and planning. When I go camping, I spend two or three days without access. However, the biggest difference is that I plan my camping trips. On top of that, my son is usually with me, so I don’t have to worry about whether or not something has happened to him, or whether or not he needs me. In these situations, unplugging can be beneficial. I don’t worry about emails or work or status updates. But I’ve had time to prepare by adding a vacation notice to my accounts and letting people now I’ll be unreachable. This reduces the worry that I’ll miss something important. Forgetting my phone is a completely different situation. In that case, I had planned to have it with me, and found myself disconnected – even though I wanted to be connected. Making that distinction is a big deal in today’s society. Before you head out, stop and think about whether or not you’re leaving your phone behind. If you don’t intend to, making sure you have it can relieve some of your stress. What do you think? 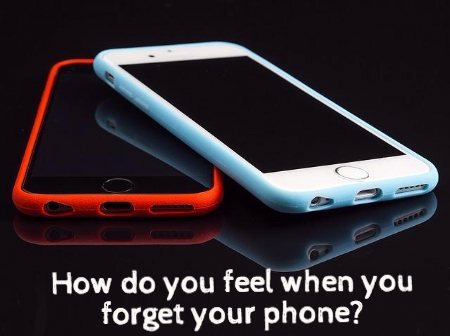 How do you react when you leave your phone behind?